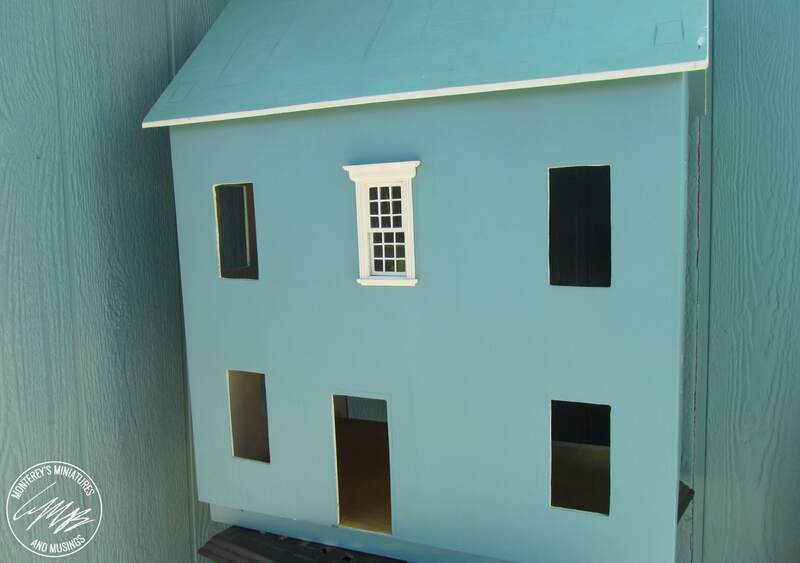 The following is the tale of my first dollhouse: its construction, attempted renovation, and current condition. 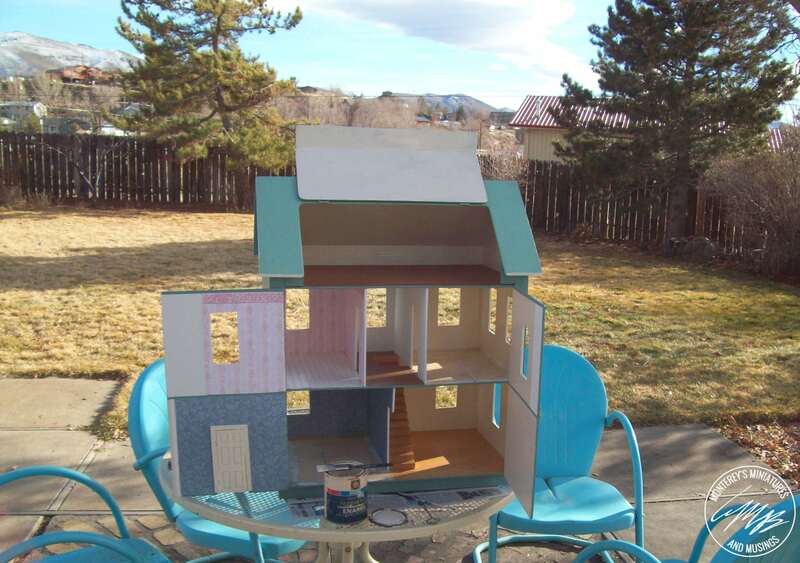 Frustrated by in-store dollhouse prices, my father decided to DIY my third birthday present. He most likely based it on the Corona Concepts dollhouse The Willow, although there are a few key differences, including the spacing of the rooms and windows. Most importantly, even though he didn’t add framed doors and windows, the house was built entirely to scale just in case I wanted to improve it later. Originally, the house had six rooms and a crawl space for wiring (you know, just in case). The living room and dining room occupied the bottom floor while the bathroom, hallway, and master bedroom occupied the second. The third floor was an open attic space, which served different purposes over the years, but it was mostly the children’s bedroom. 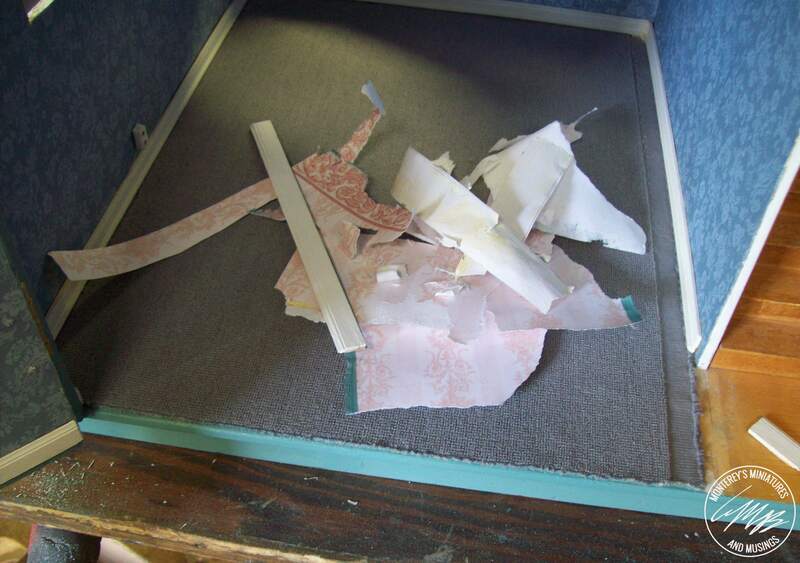 The house was decorated with child friendly materials, including felt for carpet and shelf liner for wallpaper, as well as specialized dollhouse decor. Both the dining room and bathroom had to-scale laminate flooring and the living room floor was scored to look like hardwood. 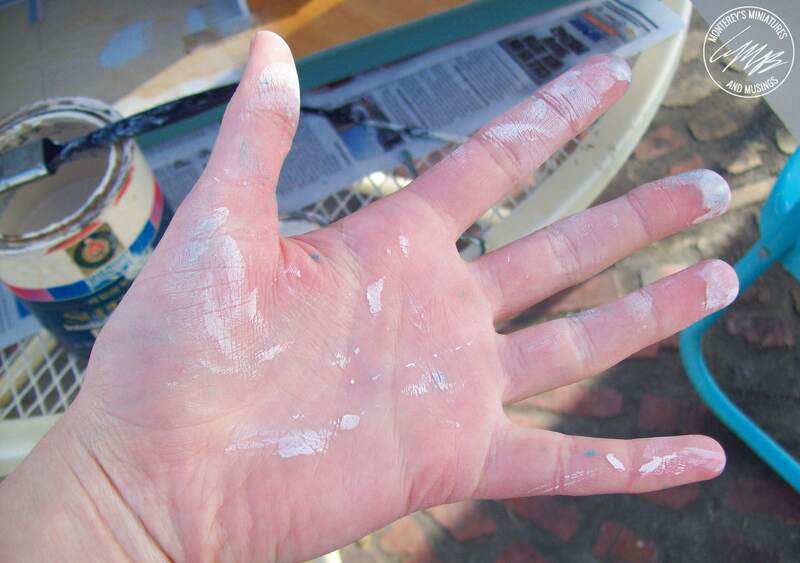 The rest of the surfaces were painted. I particularly liked the sponge-painted bathroom. There was only one staircase, which my father built as well. I loved my dollhouse excessively, which of course meant that I scribbled on every surface, stuck stamps on the walls and generally abused it. 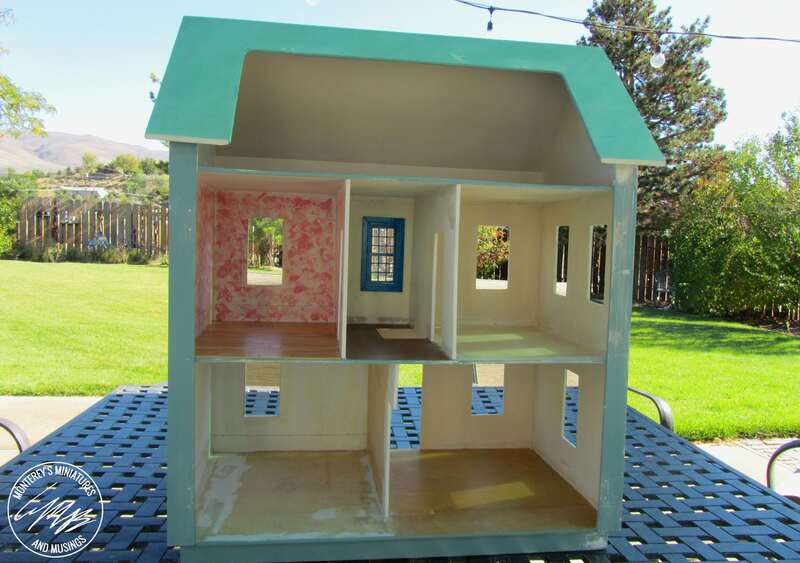 At various times, it housed 1/12 scale dolls as well as Polly Pockets and occasionally a few Barbies, but they had their own house. Later, I made comic strips set in the dollhouse. I would take photographs of the dolls and create text bubbles on the computer, which I would then print out and tape to the pictures. There came a point in my childhood when I got tired of the chunky furniture and dolls from my third birthday. Somehow, I had gotten a hold of a miniatures.com catalog (don’t ask me how) and I pined after everything in it. 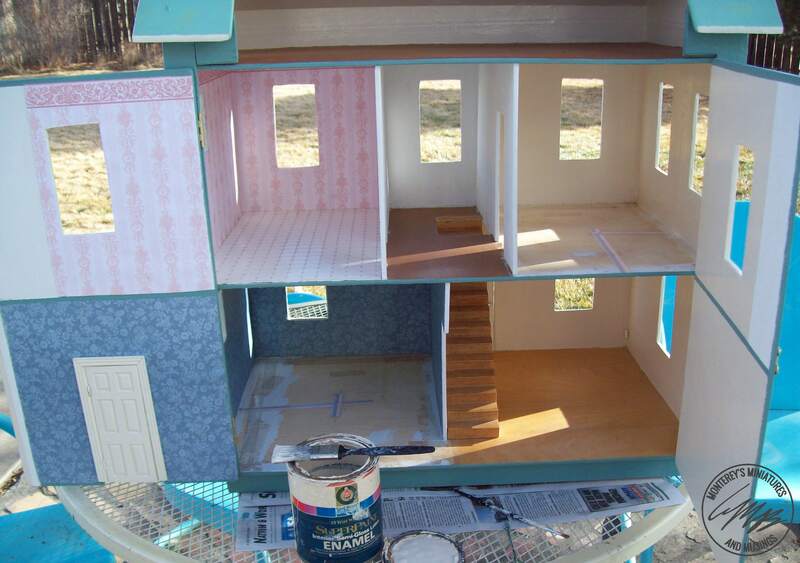 In order to improve my dollhouse, I started by repainting some of the chunky furniture to give it more flair. I even added lace around the dining room table and above each window for curtains. Looking back though, I am proudest of my clay food. I couldn’t buy anything and so I tried my hand at creating a ham and some eggs out of the oven-bake clay I had on hand. I even made them various colors. Oh, the realism! I had no idea that miniature food artisans actually use oven-bake clay (plus techniques that I did not possess in elementary school) to create their masterpieces. It was just what I had on hand. 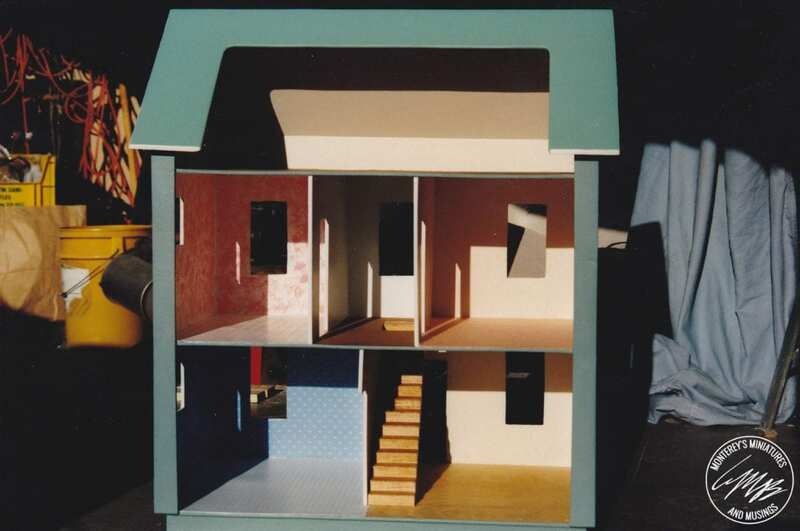 There came a period though when I set aside my love of dollhouses. Frustrated my by inability to replicate what I saw in magazines, I was embarrassed by my hobby. Dollhouses were for children, after all. I had been teased several times in elementary school for checking out The Doll House Book by Stephanie Finnegan. Being dollhouse shaped, it’s not exactly a subtle check out. Luckily, I soon discovered the existence of adult miniaturists and my house stopped collecting dust. I began seriously renovating it in 2008. I figured that if I just bought some new furniture and dolls it would look just like a Brooke Tucker room box. Little did I know. I bought some furniture kits, initially assembling them using hot glue and leaving the wood unfinished. While the use of hot glue was an incredibly amateur move on my part, it did make it easy to disassemble the kits later on and stain them. I got wise later and used wood glue on the kits, but that made staining more difficult later on since I wasn’t exactly…neat…with my glue application. 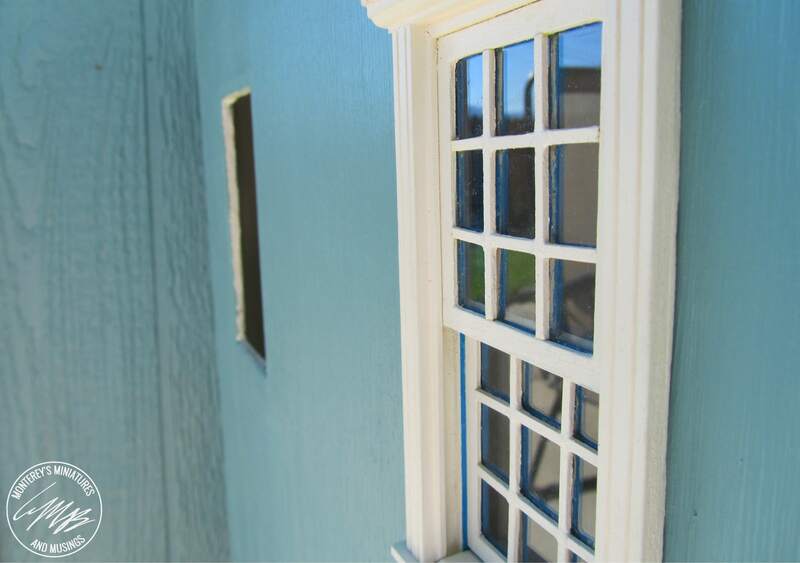 Ultimately, I realized that my dollhouse was missing some key elements like doors, windows, molding. This wasn’t going to be as easy as I thought. I dove headfirst into the hobby without an instruction manual. My enthusiasm for the project ebbed and flowed over the years (which I can generally estimate based on the frequency and the value of my online purchases), but I kept coming back to it. I learned a lot over the course of the project, particularly about proper research and choice of materials. I made a lot of mistakes. For example, I applied my dollhouse wallpaper with Universal Cement. It worked for a while, but Universal Cement tends to be a temporary adhesive. Before long, my wallpaper didn’t just bubble up, it pulled away from the wall completely. At least it was easy to remove. Secondly, I didn’t do my research. My intention was to create a historically accurate colonial dollhouse; after all, I was obsessed with the time period and my dollhouse fit the basic structure of a Georgian home. But, I didn’t know enough the first time around. For example, even though I knew that the house wouldn’t have an interior bathroom, but I didn’t realize that the house shouldn’t have carpet. I put carpet in half the rooms. Whoops. Little things like that hampered my progress because I kept finishing something and then tearing it out. Lighting the dollhouse was one of the most difficult tasks I tackled. I used tape wiring initially for several reasons. First of all, round wiring intimidated me. I thought I needed to know a lot more about electricity than I did. In reality, neither wiring system is very different in concept, but miniatures.com offered tape wire kits that were perfect for the girl who had no idea what she was doing. 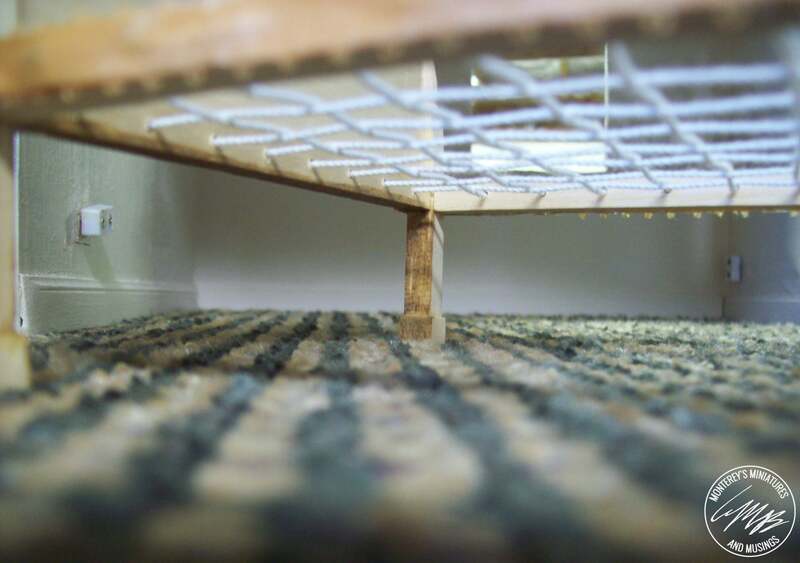 Secondly, my dollhouse is constructed of a thin, luan plywood, which isn’t ideal for routing. Plus, I wanted to avoid drilling any holes in my house. I adored my lighting. It gave the house a life-like quality that it didn’t have before. But the tape wire didn’t last. I adapted each light to plug directly into the ceiling, but those connections became loose after a while. They were like a cord that was failing. I had to plug in each light just right for it to work. The hall light was the most difficult of them all. At one point, the connection failed completely and I tried to jury-rig a solution. It wasn’t very effective. 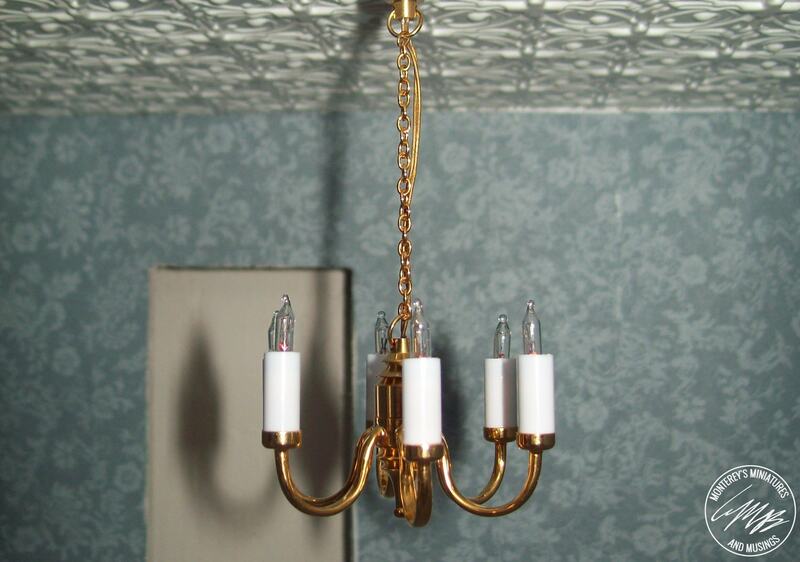 I exchanged the hall chandelier for a candle, which I connected to the tape wire with a bulky, white plug. The plug was really obvious and I found myself desperately searching for ways to hide it. Then the connection between the plug and the tape wire started to fail, plus I noticed the beginnings of corrosion between the brads and the tape wire after I removed the old wallpaper. Now, I don’t live in a humid environment (aka the Nevada desert), but I might some day. I don’t want my electricity shorting out. After redesigning my fireplaces with internal chimneys, I realized I had the perfect place to hide round wires. Using the chimneys, I could bring all the wires to the basement (you know, that “just in case” space) without excessive routing or drilling to create a more reliable, hardwired system. I have never ripped something out of my dollhouse faster. I am officially a round wire convert. 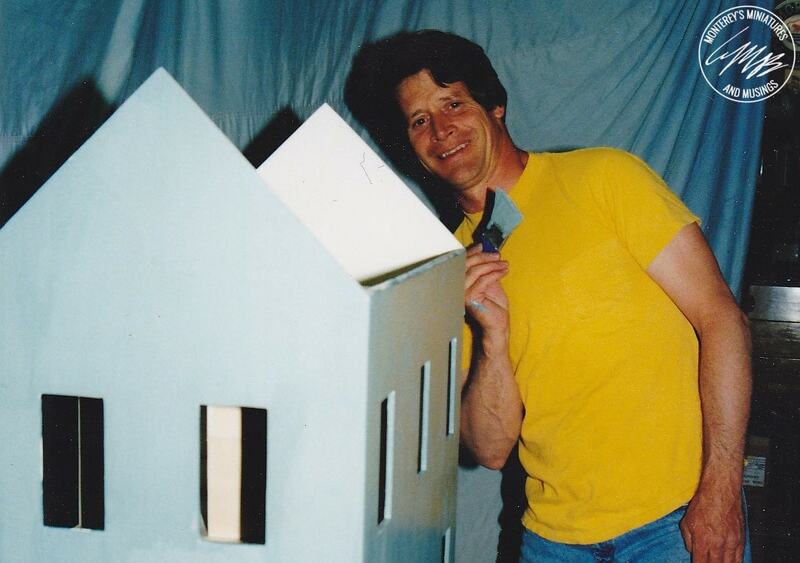 At one point, I had my dad cut panels to cover the back of my dollhouse. I was inspired by this particular scene in The Dollhouse Murders by Betty Ren Wright. But she didn’t move. Because directly in front of her was a mysterious sheeted object that came to a peek in one corner. The thing–whatever it was–was almost as tall as Amy. She leaned forward and gave the sheet a tug. Dust rose around her as the cover slipped to the floor. She dropped to her knees as her Aunt came to stand beside her. Aunt Claire ran her finger down one side of the facade. The entire front of the house swung away, revealing rooms full of furniture. Amy loved miniatures. Some of the bookshelves in her bedroom at home had been emptied to make room for tiny tables, lamps, a chest of drawers, even a piano that she’d bought with her own money or that had been given to her. The whole unhappy afternoon–Louann, Ellen, the scene with her mother–all was forgotten as she stared at the exquisitely detailed rooms. I desperately wanted to capture the sense of wonder and discovery in this scene. 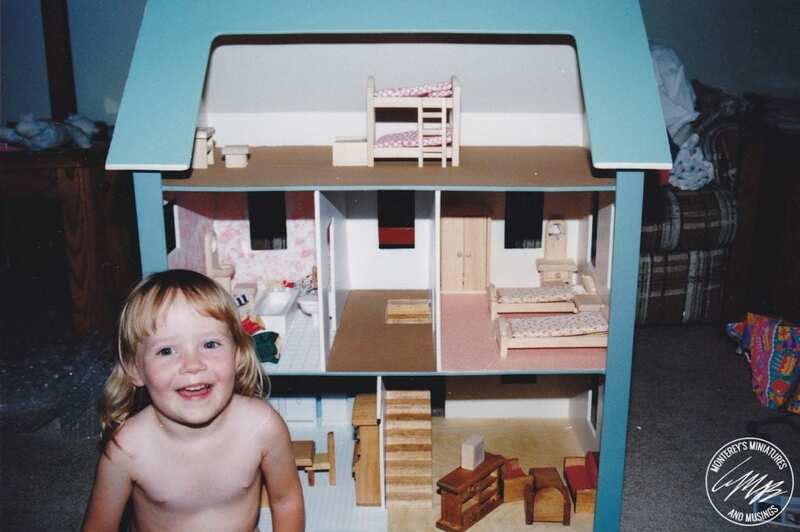 I wanted to be able to open up my dollhouse and rediscover it every time. It seemed beautiful. However, the panels turned out to be more of a problem than they were worth. Over the years, the plywood of the original structure has warped slightly and, in some cases, the original construction wasn’t arrow straight either. So, the gaps around the panels (particularly around the roof panel) were frustrating to me. Believing the problem was the panels rather than the dollhouse itself, I had my dad recut them, but they still didn’t fit correctly. Then came the issue of finishing the exterior. 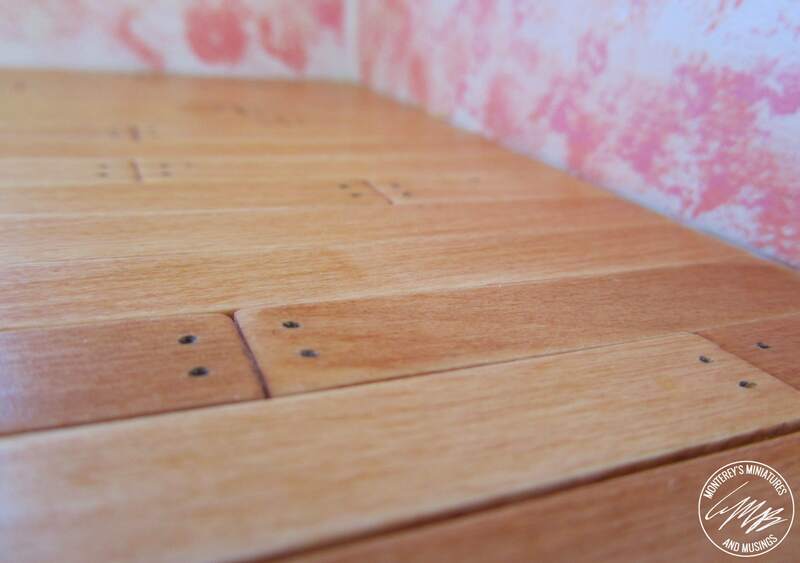 I realized that the fabrication of the panels (dictated by the structure of a back-opening dollhouse) meant that any bulky trim would prevent them from folding out completely, unlike the panels on front-opening dollhouses which swing clear. Long story short, I made the decision recently to remove the panels. I’m still not entirely sure about the choice. After all, I really loved peering in through the windows and seeing all four walls, but now I have a lot less headaches to deal with. I’ve ripped out almost all of the improvements I made over the course of the last eight years at this point. Only two remain: a stripwood floor and a single completed window. Unlike the last time, I have prepped and sanded every surface in the dollhouse, done my research, and actually thought about design. I’m not winging it anymore. Let’s see if I can actually complete the house this time around. 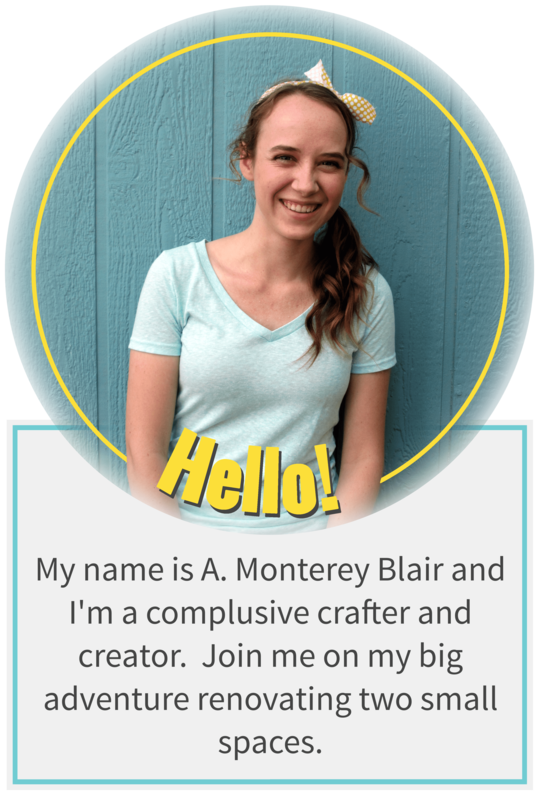 Today, I still get a bit embarrassed when I tell people about my hobby, but most people are interested by it, especially after they see how invested (read: obsessed) I am. 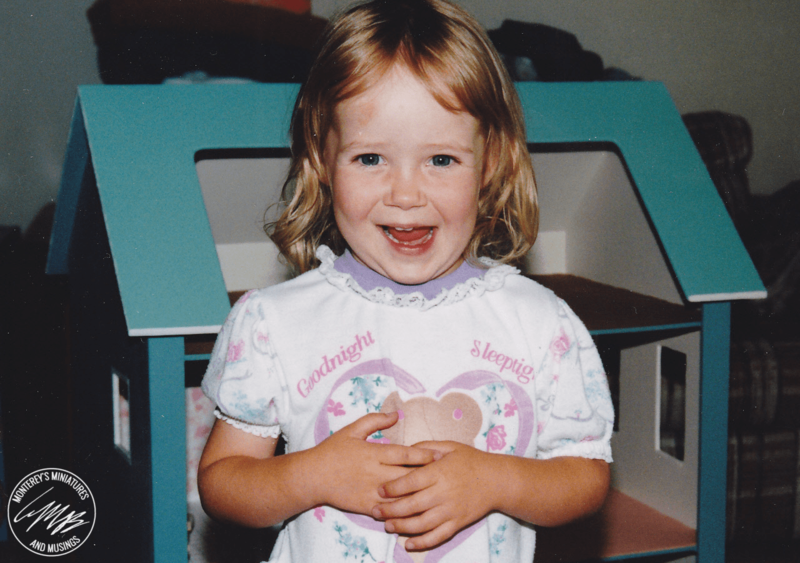 And there you have it: my dollhouse story. This blog will chronicle the second round of renovations, including the installation of my new lighting system, and all the mistakes I inevitably will make along the way. Hopefully, I’ll learn a thing or two and maybe you will too.